The Casio G-Shock Analog Gravitymaster Solar Watch features five side buttons and a front light button that help simplify operation by providing more direct access to functions. 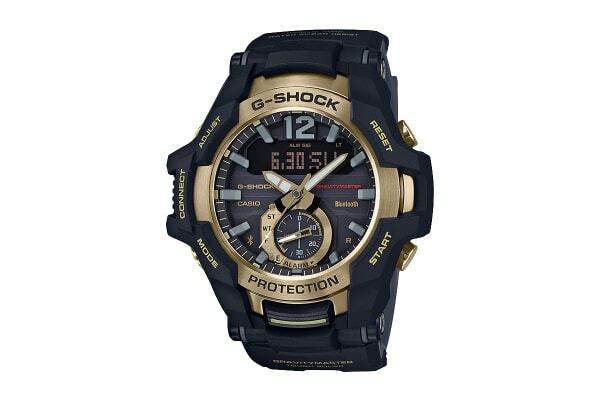 The Casio G-Shock Analog Gravitymaster Solar Watch features a large 7 × 33-dot LCD and an ion plated multi-faceted metal bezel, creating the image of a state of-the-art aircraft. Connected Engine supports time correction using a time calibration signal and Bluetooth connection. After connection with a smartphone with Bluetooth, you can use the G-SHOCK Connected app to configure countdown alarm settings, to manage waypoint memory contents and to manage and store a flight log of distances and travel times of flight missions. To ensure timekeeping accuracy, time information can be obtained from an on-line time server and used to correct the watch’s time setting.